Just because the first round has passed by and your team didn’t address one of the many needs they probably have, does not mean all is lost yet. I don’t have to run the list of NFL superstars that were plucked from further down in the draft, but it is a long list. Check below at some of these movie “sleepers” who fell to some of the later rounds for one reason or another. Some of you will be thrilled that these names fell so far to your team, and others may just be worried about the diruption in the lockerroom it may cause. There is only one certainty that comes along with the draft…that there are no certainties. It only becomes magnified the further down in the draft you go. 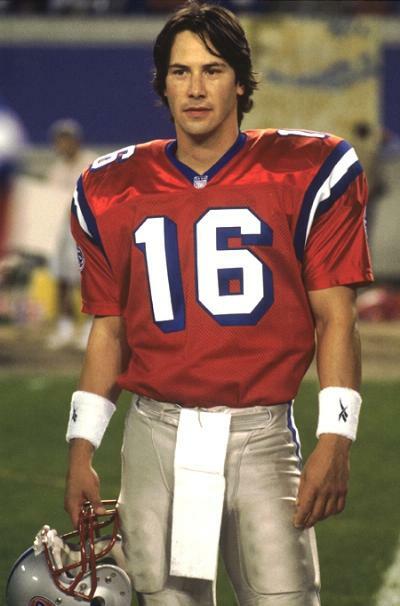 Pick #5: [Kansas City Chiefs] Shane Falco (Keanu Reeves), QB – The Replacements. KC shows their lack of faith in Brodie Croyle and is thrilled when Falco falls all the way to the beginning of the 2nd round. Falco is a guy with a big arm but carries some concerns for lack of production in big games against top-tier opponents. Still, he is too good to pass up here. Herm might not even need a reason to put Brodie on the bench now. Pick #14: [Chicago Bears] Lance Harbor (Paul Walker), QB – Varsity Blues. Harbor gets selected in round 2 by the Bears as another option for the black-hole that is Chicago’s QB’s. He overcame a devastating knee injury in high school to go on to a productive college career. He has a pretty-boy mentality but is used to having high expectations on his shoulders. He also has the knowledge of a coach which will help lead the Bears when called upon. 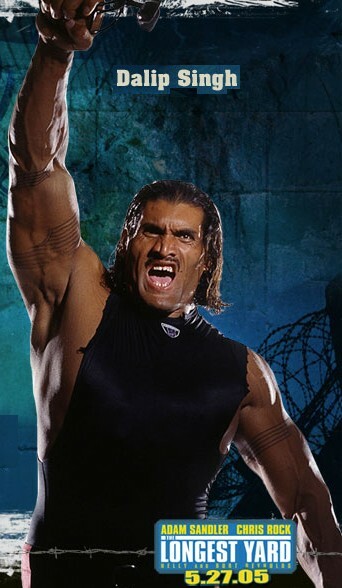 Pick #15: [Detroit Lions] Turley (Dalip Singh), OL – The Longest Yard. Quite possibly the largest man to ever play in the NFL, Turley stands over 7-feet tall and a legitimate 400 pounds. If Detroit can work on his footwork which does not match the wonders of his size by any means, they may have the steal of the draft. Kitna may also need a stepladder to throw over him, but it won’t matter much if Turley just plows over anyone and anything in front of him. 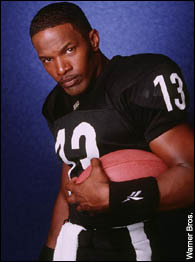 Pick #20: [TB Buccaneers] Willie Beamon (Jamie Foxx), QB – Any Given Sunday. 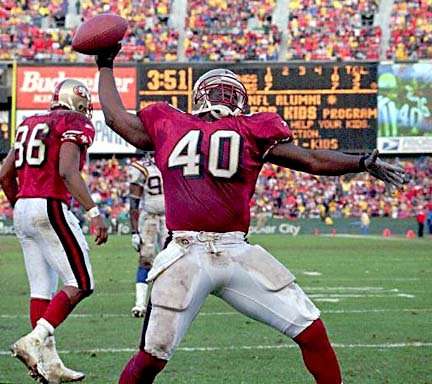 The man who calls himself “Steamin Willie Beamon” heads to Tampa as a backup to Jeff Garcia and potentially take over for him somewhere down the line. He is mobile with a decent arm but lacks the big-game preparation needed to step right in. Some have questioned his “guts” in pressure situations since at the Senior Bowl he was rumored to have yakked-up his lunch in the huddle before the first play. Pick #4: [Oakland Raiders] Ray Griffen (J. Leon Pridgen II), RB/FB – The Program. After taking Washington as their premier back in round 1, the Raiders grab the best lead-blocking fullback in the draft to clear the path for him. He also has some running ability, having lost his starting tailback spot to former teammate Darnell Jefferson, which also can help take some of the attention off Washington. This fills-out a very formidable backfield for the Raiders. Pick #24: [Tennessee Titans] Forrest Gump (Tom Hanks), RB – Forrest Gump. Once Gump started running, he never stopped. He has led quite a charming life while breaking most rushing records at Alabama, yet scouts still worried about his shortcomings. He pulled off the lowest ever score on the Wonderlic which caused him to slide into the 3rd round to the delight of the Titans. If Tennessee ever wins the Super Bowl, it should be just another day for the man who has already been to the White House…twice. 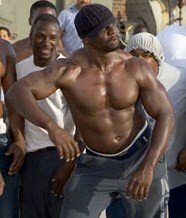 Pick #30: [Green Bay Packers] Cheeseburger Eddy (Terry Crews), LB – The Longest Yard. It ain’t easy bein’ cheesy. But now Cheeseburger Eddy can certainly afford more from the dollar menu as a 3rd rounder of the Packers. A former convict, the Pack take a huge gamble with a potentially big payoff. Eddy has an NFL physique and athleticism but still needs to stay out of trouble. Green Bay seems to be the safest place to let him run wild. 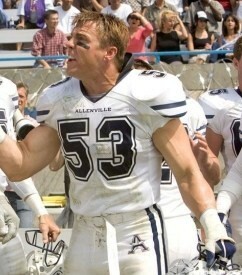 Pick #8: [Baltimore Ravens] Guard Lambert (Bill Romanowski), LB – The Longest Yard. Not one team who interviewed him liked his attitude, although it may translate to toughness on the field. He has been labeled his entire career as a dirty player, rumored to have spit on a teammate once. The Ravens decide there is no better role model for him than Ray Lewis. 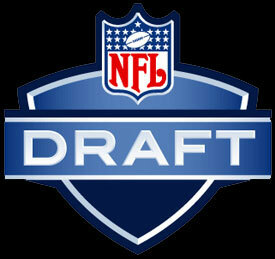 Pick #27: [San Diego Chargers] Stefen Djordjevic (Tom Cruise), RB – All the Right Moves. SD looks to fill in for the absence left by Michael Turner in the understudy role to LT. Unfortunately they don’t do much better than a guy who may even get beat out by Darren Sproles for the #2. Djordjevic has average speed at best and terrible size for the position. Not to mention those in his inner circle claim that he is a “whack-job” and practices “cult-like” beliefs. Sounds like a strikeout for SD. 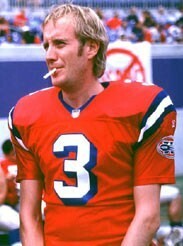 Pick #5: [Kansas City Chiefs] Nigel “The Leg” Gruff (Rhys Ifans), K – The Replacements. Attempting to remedy their huge mistake in last year’s draft by selecting Justin Medlock over Mason Crosby, KC selects Gruff in the hopes that they don’t miss again. Gruff has a monster leg with above-average accuracy, but there are many concerns with his activities off the field. Point-shaving incidents followed him all through his career but he still somehow managed better than a 90% career field goal percentage. Pick #18: [Houston Texans] Barney Gorman (Tony Danza), K – The Garbage Picking Field Goal Kicking Philadelphia Phenomenon. Houston needs someone at camp to challenge Kris Brown who missed a few clutch kicks last year and while he has the leg strength, lacks severely in accuracy. Gorman comes in as an underdog who beat the odds to get a shot kicking and while he has only average leg strength, the name of the game for Houston is hitting the ones you’re supposed to. Pick #25: [Seattle Seahawks] Derek Wallace (Larry Gilliard Jr.), WR – The Waterboy. Seattle intends to improve the depth at WR by drafting Wallace in the late rounds. At this point in the draft he is a steal. Good speed and size with somewhat suspect hands, he could be taken under the wing of Burleson and brought along slowly. Pick #1: [Miami Dolphins] Bobby Collins (Jon Pennell), QB – The Program. Parcells waits until late in the draft to take an alternative to John Beck when he selects Collins in the 6th round. It still manages to be a controversial pick due to Collins’ dismissal from the team after only managing a backup role throughout his career. He certainly has been known for effectively carrying on the drunken backup QB stigma very well. 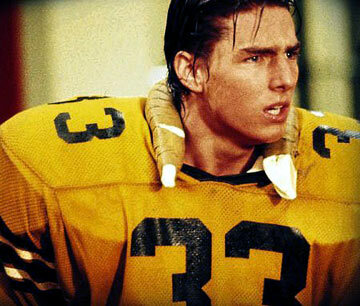 Pick #3: [Atlanta Falcons] Gavin Grey (Dennis Quaid), RB – Everybody’s All-American. Atlanta takes a stab at finding a replacement for the aging Warrick Dunn by selecting Grey in the final round of the draft. He is a classic prototype of a guy from a big program who has played in big-time games and produced but simply doesn’t have the measurable needed to be a regular in the NFL. One thing is for sure, he possesses all the intangibles and is not quite ready to deal with what life without football has to give. 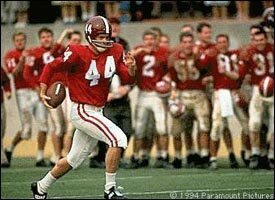 I don’t know how the Indianapolis Colts passed up Forrest Gump when he was still on the board late in the second round. Even with his historically low score on the Wonderlic Test, at 6’0″ and with that breakaway speed I thought he would have been a great selection for the Colts with the 59th pick of the draft. Gump has had no character issues that I know about. I mean he has received the Congressional Medal of Honor. We have seen what Devin Hester has done in the NFL the last couple of years, and without a dynamic returner in the last 5 years, the Colts should have pulled the trigger on Gump.